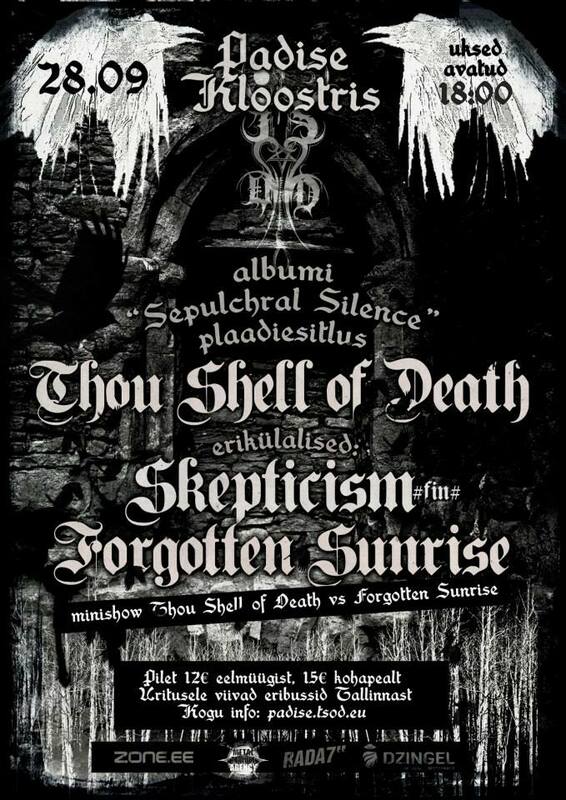 On the 28th of September in the ruins of the Padise Monastery the release show of Thou Shell of Death‘s album “Sepulchral Silence” will take place. Besides the magical atmosphere at Padise Monastery, even more happens that evening. Skepticism has promised to play 1.5 hour live set after for almost 2 years of silence. Also in addition to the line-up there will be a unique act “Forgotten Sunrise vs. Thou Shell of Death”. Padise Monastery is located 50km from Tallinn, the capital of Estonia. There is parking available near monastery and organized busses will help the true fans on route Tallinn-Padise-Tallinn at the price of 5€. Show will start at 18:00 and lasts until the last band ends before 23:00.